Brian Boydell (1917-2000) was born in Dublin and educated at Cambridge University, the University of Heidelberg, the Royal College of Music and the Royal Irish Academy of Music. In 1959 he was awarded the MusD degree of Dublin University. He was Professor of Music at Trinity College Dublin from 1962 to 1982 and was later a Fellow Emeritus of the college. Brian Boydell was a founder member of the Music Association of Ireland and founder and director of the Dowland Consort. For more than twenty years he was conductor of the Dublin Orchestral Players and was frequently guest conductor with the RTE National Symphony Orchestra. For some years he was a member of the Arts Council. The many honours he has received include an Honorary DMus from the National University of Ireland, Commendatore della Repubblica Italiana, and Honorary Fellowship of the Royal Irish Academy of Music. He was also a member of Aosdana, Ireland's state-sponsored academy of creative artists. His compositions, written for a wide variety of media, include four string quartets, works for solo pedal harp and lever harp, a violin concerto, orchestral, chamber and choral works. The Lauding Ear is based on Psalm 150, a psalm of praise which names a range of musical instruments used in ancient temple worship. These are all emulated in the piece, and the sequence follows the order of the psalm verses. Two other musical sources are briefly referred to later in the work: Jewish composer Felix Mendelssohn’s setting of Psalm 22, ‘My God, why have you forsaken me’, explores the idea that praise can be a prayer of sacrifice at times when the sentiment is far from our emotions. This theme is quoted in the timpani. The other musical reference is to illuminate the words ‘clanging cymbal’ in the psalm: we associate these words with those of St Paul in 1 Corinthians 13:1, namely that acting without love is akin to a clanging cymbal. Therefore the chant, ubi caritas is quoted (in harp harmonics) as a reminder of the necessity of love in any action. Two of the musicians process with instruments at each end of the piece to suggest that a festal psalm like this one would originally have been used with movement and procession. Some portable instruments associated with worship are included, for example, temple gongs, temple bowls, temple blocks, a portable harp strapped to the player, and water. The immersion of an instrument in water echoes the idea of baptism. The title of the piece is mainly an anagram for Dun Laoghaire and suggests that listening itself can be an act of praise. The work is written in memory of my uncle, Michael O’Leary, a music lover devoted in faith. 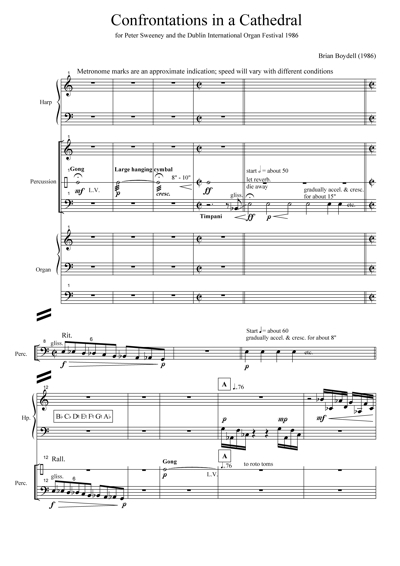 Composer’s note: if a portable strapped wire- or gut-strung harp is not available for the opening and close of the work, the percussionist should process alone, while the harpist remains seated and uses the pedal harp for bars 1–9 and 205–219. Organ registrations given are suggested colours, and are subject to balance when applied to different instruments. Percussion required: Roto toms, large suspended cymbal, gong, Chinese cymbal, small cymbal, tubular bells, xylophone, temple bowl, 2 temple gongs or similar of varying sizes, large bowl of water (towel), and 4 timpani tuned to G2, B2, C3, G sharp3 as indicated in bar 1 of the score. Composer’s note: Being written for performance in a reverberant cathedral, precise coordination in ensemble is not required. The harp should be placed at the front of the chancel, and the percussion should be some distance away. 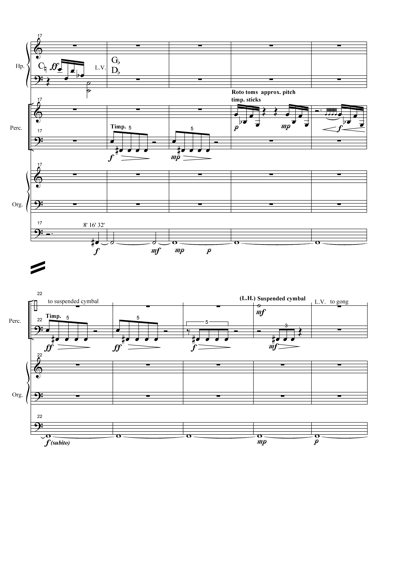 Editor’s note: some errors in the original score have been corrected, and use of enharmonics is suggested in the harp part of bars 42–44, 126–128 and 142–144. Percussion required: Roto toms, large suspended cymbal, gong, Chinese cymbal, small cymbal, tubular bells, xylophone, and 4 timpani tuned to F sharp 2, B flat 2, E3, G3. The support of the following is most gratefully acknowledged: David Adams and the committee of Dun Laoghaire Organ Concerts, Barra Boydell and the committee of the Boydell Centenary Conference, Tim Creighton Griffiths, Noel Eccles, Simon Harden, Denise Kelly McDonnell, Roger Moffatt, Carole O’Connor, Paul Smyth of Grant’s graphic design, Gavan Woods and St Patrick’s Cathedral. 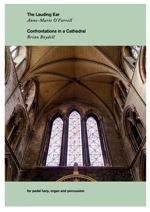 Front cover image by kind permission of St Patrick’s Cathedral, Dublin.